Guys I'm so excited to bring y'all another guest post! When I was asked to help out on this post my response was sure, but only if you'll write one for me because I'm sneaky like that All kidding aside, I haven't actually working in a law firm yet because life happens but I know that this is a really scary thing for any unexperienced law student so I wanted to get some insider perspective for y'all so you can know what to expect! Enter Bailey who snagged a well-paid internship this summer (totes not jealous or anything) and learned a lot about the real law world and is nice enough to share her wisdom with y'all just in time for OCI season to kick up. Hey, everyone. Well, the first half of this semester has rolled by, and suddenly it seems like finals are looming and pressure about the summer is setting in. Just last week I was sitting in counseling, explaining to my therapist that everyone around me is stressing out because they’re searching for summer jobs. “Already?” She asked me. And then I had to dive into a long explanation about the legal world, and how searching for a summer job means starting in the fall and figuring out a job for after graduation should be settled by the start of 3L year. Now, that may be exaggerating a little bit, but for the most part it represents the job searching timelines in the legal field. So, with this job search season approaching, I thought (well, actually, Nikki thought and invited me to write about) I would share some of the things I learned last summer in internship! For background on what I did this summer, check out my post all about my internship! So this one should be fairly obvious. As you expect, the point of a summer internship in law school is to gain professional experience and learn more about lawyering. However, I did not fully expect that I was going to learn more in one summer than I learned during my entire first year of law school. No, I’m not exaggerating. It seemed like every single day I learned about ten new things, either from researching, writing, talking to attorneys, or just observing. 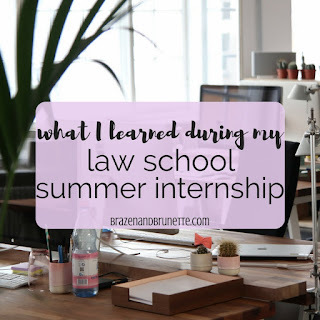 Because of all of the experience I gained in the summer, I solidified concepts that I learned during my first year of law school and came into my second year more confident than I could have imagined. So while it might seem like a given, it’s hard to prepare for the amount of learning you will experience in one summer. Before this summer started, I sort of leaned toward wanting to work on the more transactional side of things anyway. As the summer progressed, that preference was affirmed. As mentioned before, I discovered that I didn’t want to be a litigator. However, I loved researching and solving the clients’ issues with my computer and my writing. I loved thinking through a difficult problem, and figuring out how to draft the best will or figure out the right tax plan for a business. Thus, now I can focus my career path in this direction. Alright, so this probably seems really cheesy. But it is so true. From the moment I interviewed with the law firm I’ll be working for, I was unapologetically me - because I tell my personality meshed well with those at the firm. It was an atmosphere which enjoyed humor and big personalities, two of my specialties. For awhile, it made me nervous that I was kind of free with my jokes and a little bit louder than some of my coworkers. Especially because one of my coworkers was nothing but proper and polite all summer. However, it turns out that I got an offer back and he didn’t. So it goes to show that being authentic can pay off. I don’t know how many times I heard horror stories of summer internships, where students were forced to work 65+ hours per week, sleep on cots in offices, and generally worked to death. I luckily found out that, while my firm did expect a full work week from me, they didn’t expect me to kill myself. And I was very deliberate about trying to maintain a work/life balance. This was essential to keeping my mental health a priority during the summer. When I came back to school from this summer, I found out that several of my friends had leftover stress from their summer jobs and had issues transitioning into school. However, because I made balance a priority during the summer, I was able to transition better. At one point during the summer, I was cite checking an article for a partner, and one of the citations did not match the source and I couldn’t figure out what it was actually supposed to go to. So I found the right case to match the citation, fixed it, and turned in the assignment. Less than an hour later, I got an angry email telling me that the part of fixed was not correct, and the partner was questioning whether or not I was actually capable of doing the assignment. I realized my error, fixed it, apologized for it, and sent it back. Luckily for me, in the end I actually gained respect from that partner for taking ownership of my error and fixing it quickly. However, it would have been even better if I completed the assignment without error. I could have done this by simply asking the partner about the confusing citation. So when it doubt, ask for help - it will pay off. One thing you should be doing in your summer internship is cultivating relationships with the attorneys around you. However, relationships with other staff members may prove to be equally as important. 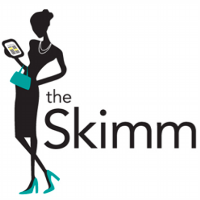 If you don’t know how an attorney likes his or her memos formatted? Ask their assistant. Don’t know where someone’s office is? Ask the runner. Want to know the juicy office gossip? Secretaries know literally everything. So make friends with these people and they will help you be an even better intern. Indulge me with one more cheesy lesson learned - because I learned that I’m going to love being a lawyer. While the work was hard and the hours could get long, I loved the work I was doing and the people that I worked with. The second I got back to school, I missed my job. I was lucky enough to receive an offer to return to the firm I was at and I absolutely cannot wait until next summer. 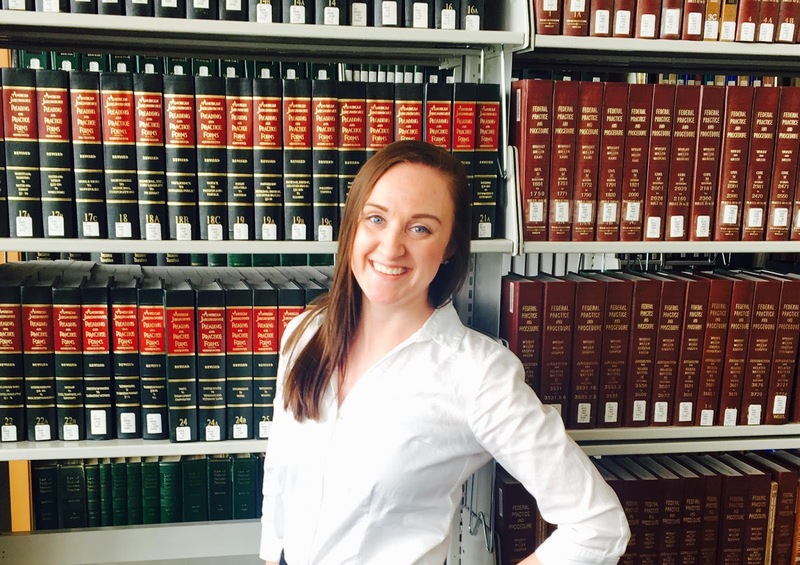 Throughout my internship, I realized that I am unbelievably excited to be a lawyer, and thankful every day that I stumbled into this career path.